This entry was posted in Basic Concepts, Developing Alternatives, Emerging paradigm, Exchange Design, Finance and Economics, Prescriptions, The Debt Imperative, The Political Money System and tagged credit clearing, end of money, interest, private currencies. Bookmark the permalink. Mr. Thomas H. Greco, Jr., I am a member of ICRA (International Currency Reform Association) and we are devising real world solutions that do not require the use of currency or actions such as payments on oder to transact both globally and locally. My main question: Why are you mentioning a world without money at the begining of your talk and then proposing a solution that still involves currencies (albeit private). The word “money” has many different meanings. 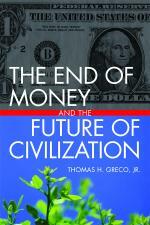 When i speak of the end of money, I wish to break through the confusion that most people have about it. I foresee a world without money, “as we have known it.” The future system of exchange will be “moneyless” in the sense that buying and selling will be recorded as debits and credits within associations of traders. Most people have trouble conceptualizing such as world. Private currencies are a step in the direction of empowerment that makes it easier for people to understand the potential next step. That said, the money crowd has threatened (through its global mouthpiece) to use the âSampson Optionâ if anyone tries to spoil their game.